Loves, are you on the process of preparing your wedding day? Bridal hair styles are in your preparing list. How about trying a unique hair style to look extra-special on your wedding day? Bohemian looks are popular in 2014. It is not true that hobo look is only suitable for a beach wedding. In fact, loose, effortless waves or waterfall twists are good hair cuts for all 2014 wedding styles. Honey, if you do not like to put all of your hair down, you can also try half up half down look. Place a pin into your hair to hold layer up, making hair near your forehead away from your face, and leaving the additional layer for an enchanting hair look. Long and loose wedding hair cuts are hot. Country weddings go well with the style. With shinning headband across foreheads, curls naturally flow over your shoulders, looking very attractive. Boho half-up style features a braided headband. Braid the up half hair and end into a tie. Apply a flower over the braided knot. Braids pony with a flower, a cloth, or a fresh flower headband looks are another hot boho wedding hair styles. Braided updos with flowers headband look very chic and charming. You are just angle from heaven, easily and successfully leaving the most unforgettable impression for the wedding day. Loves, you many have a question in mind that what I can do when I have short hair. No worries~!!! Hair extensions clip on are quickest way to lengthen your short hair. 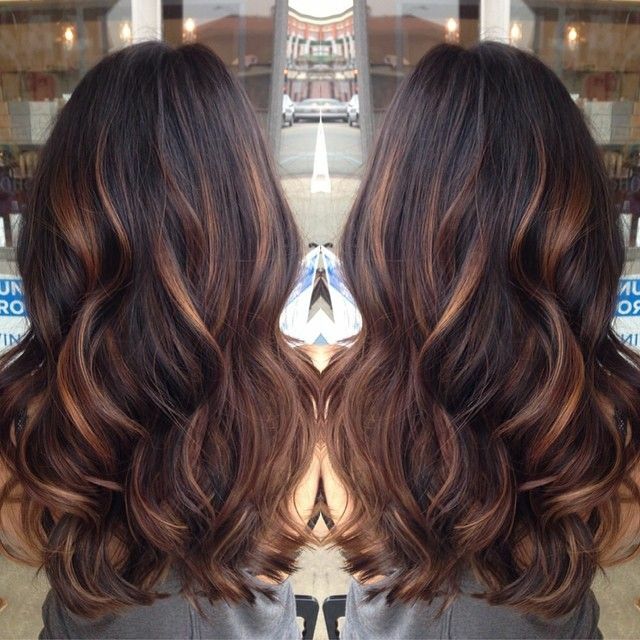 Choosing a color matching you hair go well with your hair color is an element you shoulder take into consider. The hair tool can also add volume to thin hair for fuller hair look. Are you in the situation that you are not sure of what to do with your hair for updos? Follow celebrity updos and choose your best-matching one. Among all hair styles, prom is considered to be most elegant, romantic, trendy and classic. Get inspiration from celebrity public looks: Hollywood red carpets, award ceremony and fashion show. Add a little creation to what they have already done, for example adding a headband for your 2014 prom like Lupita Nyong did when winning her Oscar. Both long and short locks can try prom updos. Katie Cassidy’ style features curls and braided pieces. A modern spin highlights this classic updo. Her modern updo is showed at 2014 Academy awards. Brown highlights add vivid tone to her top knot updo look. Eva mendes’ pinned-updo and side-swept bangs perfectly fray framce her square faces, looking soft. Sophia Bush tie her dark locks into a low bun, sitting elegantly to one side. Her swept-side bangs perfectly frame her oval faces, looking sexier and charming. Love her golden blonde hair. Retro updo on 2014 red carpet features loose waves and a sparkling hair clip. Waves bangs beautifully sleeping on her forehead bring an unexpected element to her whole look. Her shinning blonde highlights her jade green eyes. Her red carpet hair style features a twisted bun and wavy side bangs. Katie Cassidy updates French twist with modern element: large volume at the crown and texture hair. The French hair style makes her look very charming and romantic. Milery Cyrus on red carpet 2014, in my opinion, is the best option for 2014 prom night. apply a pin to tie up hair into a middle bun, adding extra volume at the crown. The style looks good and lovely from all angles. Taylor Swift ties her hair up into a soft loose updo. She got very nice neckline and shoulders. The loose updo and sweetheart strapless gown shows off her shoulders. Side parted bun and retro waves is her red carpet hair style. Follow her twisted bun with a diamond headband. For your prom night, replace the headband with a matching your dress color headband. It doesn’t cost too much. Kirsten Dunst has become L’Oréal hair spokesperson. Keep track of her hair looks wil lead us to catch the right hair color and styles trends 2014. She will bring new values to L’Oréal with her strong personality. Get hair inspirations from her hair looks over the past years. uss2224 at blog.vpfashion.com will help you achieve the celebrity look above. Hair accessories like hair head band are always hot to girls. Kirsten Dunst wear headband to make her look cuter. Curls along faces in long styles look great on girls with round faces. Side ponytail in curls looks great. Kirsten Dunst hair color is blonde. In most public looks, she has a little bit color change, always in blonde shade. Once in a while, she change her hair color into brown, or dark honey blonde. Blonde or platinum blonde will be hot hair colors in 2014. Want to have long and thick blonde hair? Hair extensions in blonde will help you have your desired looks. At vpfashion.com or blog.vpfashion.com, you can find a category on blonde hair extensions in kinds of hair length and blonde shades. 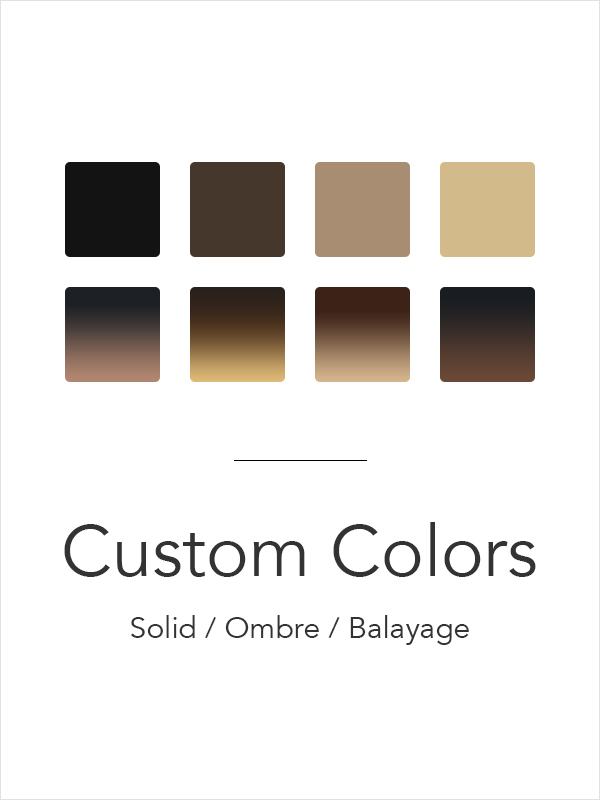 As for color proportions, hair length, you can personalize yours as you like for free. We’d love to hear about your thoughts and ideas on extensions hair clip on in ombre color and solid-color. Contact us at: service@vpfashion.com. Black hair is most popular hair color for girls all over the world. Black hair is also called as natural color, the best hair color for dying other light color hair, like blonde and brown. Ombre color also often starts black at top, other bright color at the bottom. There are many 2014 trendy black hair styles for long hair. If you happen to have short hair in black, you are still close to the following long trendy hair styles with our 22inches or 24 hair extensions. Long black wavy hair gives you more elegant, classy and peace looks. Big waves are full of luxury. Get some hair inspirations from the following hair list for your natural black hair. Ask your stylists to add designs into it. By the way, keeping the hair shape takes you only a couple of minutes, a perfect option for work women. Sleek black updos have a touch of glamour and elegance. Straight hair updos work perfect for African American women. Updos works ok for any hair texture. If you have beautiful facial features, the style will help show off since it takes all hair away from your face. Sleek ponytail is a good option for black hair. Straight, curly or wavy, you still can tie it into a ponytail regardless of its style. 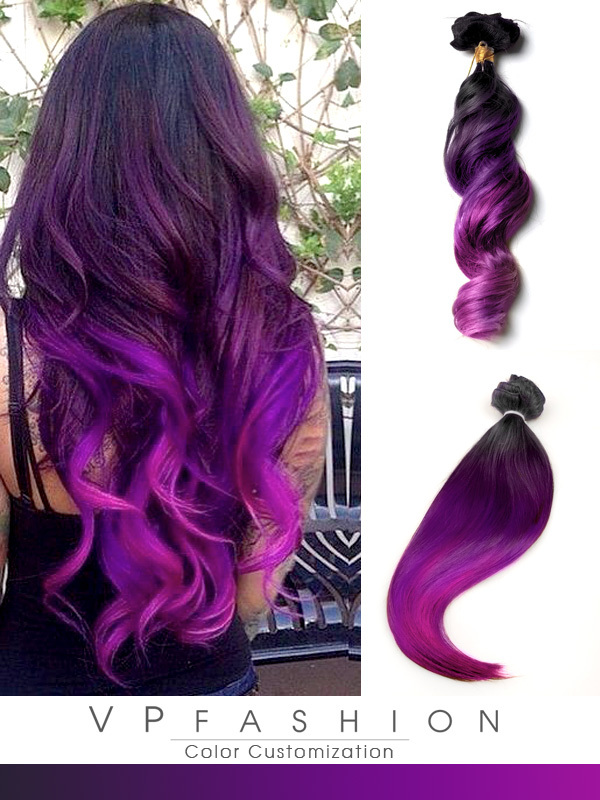 Black hair at top and other hair colors, such as brown, blonde, pink becomes black ombre color. 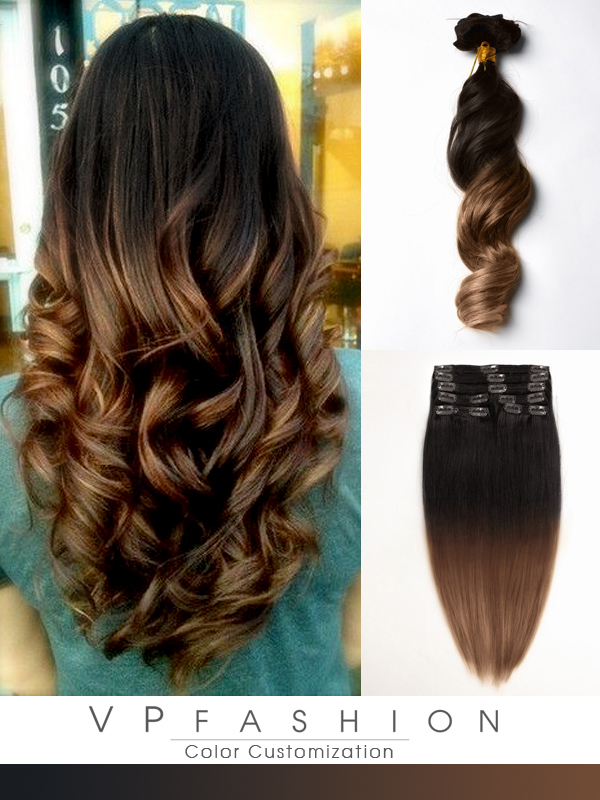 Black ombre color has been wide popular to girls. 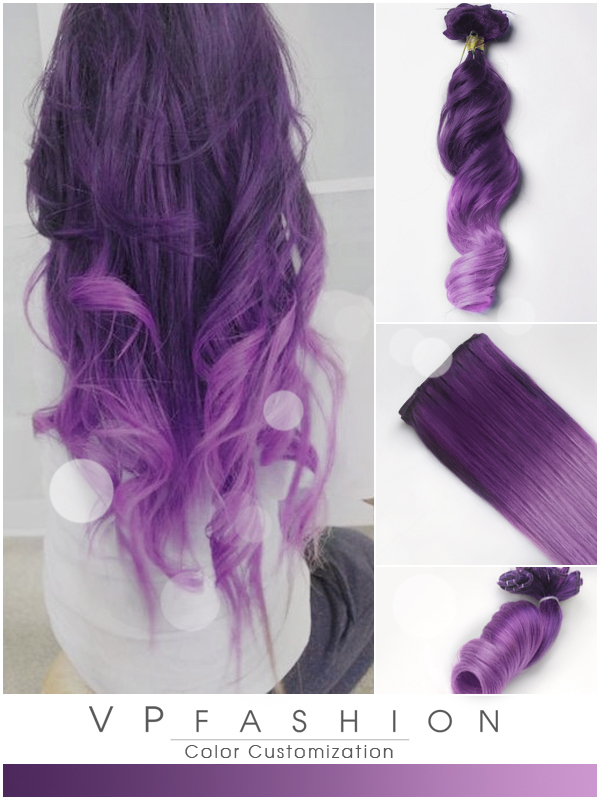 Since human hair black ombre extensions will have no damage to your own hair, and at the same time satisfied girls’ needs for beautiful hair color change. Our video gurus recommneded trendy hair styles with black ombre hair extension. Uwo720 in the photo is #2 and #27s ombre. #2 is black color, #27s is close to brown color. A hair color proportion is Top 55%-Bottom 45%. Hair length is 20 inches and texture is silky wavy. It has other color combination which can be chosen at our site vpfashion. Uso520 is three-color ombre Many celebrity looks in public wear the one. Style it into other haircuts. Real Product Sample hair color is Top#1b(25%)-Middle#27s(40%)-Bottom#27(35%). Christmas is coming up. Want some hair styles inspirations for your Christmas party? Christmas party is a big gala. On that big day, girls will dress up to attend Christmas parties. Hairstyles are the last thing you need to consider. What are hot styles for that day? A simple little braided styles will add a touch of fashion to the big day. In the following, we will introduce you some simple yet chic hair cuts for Christmas. updos is suitable for girls at any ages, and great for most occasions. updos with curls look more elegant, and charming. For Christmas parties, a shinning headband is worn for more chic looks. The style works best with medium hair or long hair. If you have short hair at the moment, try clip on hair extensions to lengthen your hair. The fancy one works also perfect for prom, homecoming, New Year, wedding, holiday and other special occasions. Curly updos look always elegant, perfect for also any occasions. Fishtail braided bow ponytail is the combination of fishtail and braided bow. The style looks cute. The cute braided hair style is on pinterest, tumblre and other photos sites. There are the final looks of the style. Today, we collect the concrete steps of the styles for you to follow for parties. What style could be cuter than the fishtail braided bow ponytail? 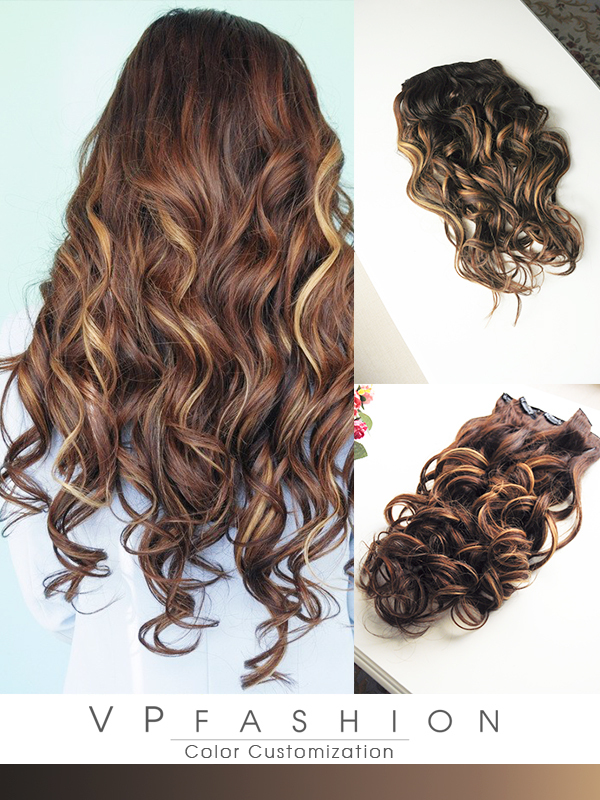 Style your hair into long wavy or curly. Pin a holiday flower to one side. If you rush to a dating, the style will take no minutes, and create a perfect girlish look. A flower on head works well with the festival, expressing your happiness. Flowers can also be replaced with a headband with a flowers. Try the glamour style for 2013 party season. It features height at the crown, sleekness at the sides and volume through the mid-lengths and ends. Blonde or brown color is the best hair colors for the styles, while black hair color is not perfect for the style. Medium short is perfect. 16 inches, 18 inches extensions are for medium length hair. The hot sale 4 extensions hair in the following can help you change your hair and lengthen your hair to make the hair styles in the post. Get hair inspirations for Christmas parties. Hope the hair cuts ideas above will give your holiday inspirations to set you on the way to looking great. 2013 holiday is coming up. Many wonderful things happen in the season, such as dating, parties and family reunion. Once those invitations come all the way to you, you need to think about your whole look. Among the whole look parts, such markup, dressing and accessories, holiday hair styles are what you need to carefully think about. So we collected easy styles that take you little time and effort but work for any special occasions. It is great for you to have at least one of them or you can bookmark the post for your next visit. The following styles are a little more formal, but are still time-saving. Create formal, romantic and chic look. If you happen to have quite short hair, and even one month later, your hair still cannot grow long enough to have your desire hair cuts in the following. Do not worry! Turn to 14 to 24 inches hair extensions to have your desired length. Top big loose curls are pulled up black and tired up to be balanced with the two-side left down hair. Secure your hair with hair pins. Leave a few stands of big curls on two-side for face-framing looks. Messy top knot is for elegant looks. The style is all the time fashion forward. Secure your long big curls into a ponytail on top of your head. Then twist the already-done ponytail around the ponytail root. Apply a matching hair color pin to secure the knot. Curled low ponytail is always fashion-forward, never goes out of fashion. Pull back one-side curls and secure it with pins. Then pull back the other side hair to meet the pins. During the step 2 processing, one thing with care is to fold the hair to cover the hobby pins. Apply one more pin into the fold to secure the hair. Gather together the remaining hair into a low ponytail. Secure it with a elastic that matches your hair color. The last step is to use middle size of the ponytail to wrap the section of hair as many times as you can around the elastic, and then use a small hair pin to secure. Low ponytail covers many more styles, such as one side braided ponytail, double French braid and straight sleek ponytail. Remember, sleek ponytail looks best with straight hair. Among all celebrities, Taylor swift attracts most attentions from girls with her fashionable looks and trendy hair styles. She dresses herself up in fashionable, feminine and romantic way to send young people the message that fashion, elegance and youth can be combined well together. Her public hair looks cover half up and half down, updos, buns, pinned up ringlets. All those styles can be made with long hair, as for short hair there is no problem anymore with the help of 22 inches hair extensions. Long Hair long hair is one of the most classic styles, and never goes out of fashion. Long style is more girlish, and curly one is more feminine. Both styles are easily to be taken care of, only takes a couple of minutes to be styled. Applying a little spray to your curly hair will make it look more polished. They are lovely by many women in workforce. Half up half down style is suitable for straight, wavy and curly hair, best suitable for wavy hair. It is a perfect option for girls with beautiful faces, since no hair in front to hide your faces. Half up and half down is also a hot choice for weddings. Under a wedding veil, it looks fashionable. The style with a modern twist looks more vintage. By the way, it is time-saving style, too. It takes only 5 or so minutes. There are also some tricky styles too, looking more special. Her updos in public cover braided, retro, and bobby pinned updo. Those updos are worn with different bangs, ranging from full fringe, face-framing tendril to side-swept bangs. Taylor swift has attractive looks in buns. In many girls’ opinion, she gives bun styles new touch – elegant, romantic and modern. What she worn covers twisted, classic, and loose bun. Bun size can be large and cute. Sleek buns without bangs look good. If you like to make a change, you can also make a few loose curls around your faces left. Bun with a few loose curls around the face will look more feminine. The style is made by adding cute ringlets into retro updos, a typical hair style on her red carpet show. Ringlets are soft and loose, making her looks very striking. Girls can have a try, too for your parties. Long hair can be made into more and delicate ringlets, looking elegant and romantic. Want to try this? You shoulder make sure that your hair is long enough and healthy enough. Updos stands for classic, glamorous, elegant and vintage looks. They are always top in stylish list. Brides love to make updo hair cuts to match with wedding gowns. Celebrities love to have updo hair styles for formal occasions, like weddings and award ceremonies. Updos are perfect styles to work with your dress and accessories. Top 5 kinds are introduced one by one in the following. Here is a list of updo styles in previous posts. A cute updo is for a simple, yet chic look. They are perfect for teenagers. The style is very easy by following steps: first tie your hair into a medium to low ponytail. Second, split the ponytail into halves, and then twist one of them into a bun shape, the same to the other half. Third, apply elastic in both ponytails. Creating a cute updo with curly hair will have more fashionable looks. It is a stylish and chic look. They are neat, can be kept in shape for a long time. To create the bun, hair fist is made into a low ponytail and secured with an elastic band. The last step is to twist and wrap around the base of itself. The cut looks pretty and romantic. The style takes minutes to be done, looking sophisticated. The style looks formal and elegant. Many celebrities love to try them. Girls can get great inspirations to look good. Choosing the one will never go wrong, since the style is always in the popular hair trends. Messy updo is stylish. It is good enough that the hair types work well for all hair types: straight, wavy and curly hair. By adding a fringe angle and hair to both sides of the face, a round face will look longer. For a square face shape, the style will soften face angles to look long. Updos cover a long list except for the ones above, including others such as side-swept, pretty plaits. All the hairstyle introduced above are made on long hair. For short hair, come to hair extensions in a certain length range: from 20inches, 22 inches to 24 inches.